Your free/busy times are shown when someone invites you to a meeting they are scheduling. 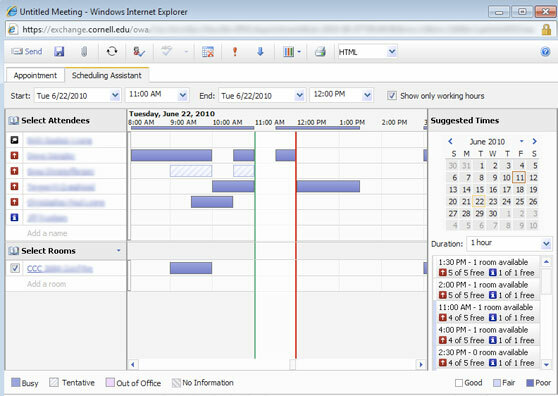 The meeting proposer can see your free/busy times in the Scheduling Assistant. Tentative - something is scheduled on your calendar, but it's okay to schedule another meeting then. Busy - something is scheduled on your calendar. Out of Office - you've blocked time on your calendar and tagged it as "Out of Office." No information - your calendar information is not available. If you're happy providing this level of information to other calendar users, and most of our users are, you don't need to take any steps. Your Office 365 calendar comes set up this way. If you would like everyone, or just some people, to see more details about your Office 365 calendar, you have a few options. You can adjust your free/busy settings (see below). You can share your calendar, so other people can open it just like they can open their own calendar. You can delegate your calendar, so other people can manage it just like you can. You can adjust your free/busy settings using Outlook for Windows or Mac. These options are not available in Outlook on the Web or Apple's Calendar application. The setting recommended below will let everyone see the subject and location of the items on your calendar (instead of just the start and end times). Your private items will still be private. If you don't normally use Outlook, you can use either one just once just to adjust these settings. Your changes will be stored on the Office 365 system. The IT Service Desk has a computer you can use to adjust these settings. This setting affects only what people see when they use the Scheduling Assistant in Outlook when proposing a meeting. It does not allow everyone to open your calendar and browse it. To allow everyone at Cornell to view the subject and location of items on your calendar, follow the Share Your Calendar With Everyone at Cornell section of the article linked below for your email client.